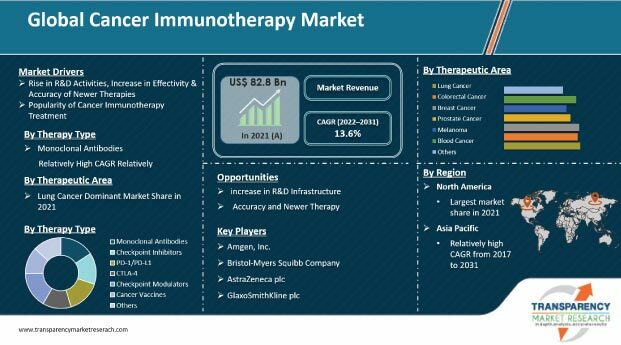 The global cancer immunotherapy market is expected to face certain restrains that might affect the growth of the market. Stringent government regulations are one of the major reasons for the hindrance of market growth. There is always risk of side effects that can affect the growth. Emerging economies cannot afford expensive development cost of new drugs thus hampering the growth. Poor infrastructure for cancer diagnosis and screening is envisaged to trouble the growth in the coming years. Prolonged consumption of immunotherapeutic drugs are likely to cause major destruction of organ or failure of organ. Other side effects are flu like symptoms, mouth sores, and skin reactions that can cause hindrance of the market during the forecast period.